Figure 1. Action of the Achilles tendon. Figure 2. 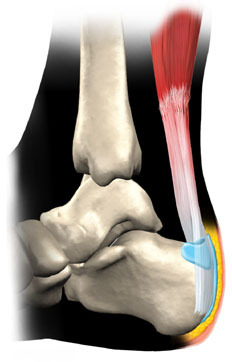 Achilles tendon and area affected by Achilles tendinitis (area shown in yellow). The Achilles tendon, or tendo calcaneous, is a strong band of elastic connective tissue at the back of the ankle. It is the largest and strongest tendon in the body. The Achilles tendon connects the calf muscles to the heel bone, and can be felt as the thick springy tissue just above the heel. The spring provided by this tendon is very important in walking, running, and jumping (see Figure 1). The Achilles tendon is formed from the gastrocnemius, soleus, and plantar muscles of the calf and is attached to the calcaneous (heel bone). It is named after the hero of Greek legend Achilles, whose only weakness was his heel. Ancient surgeons erroneously regarded wounds or serious bruises of the Achilles tendon as fatal. Minor injuries to the Achilles tendon are common and usually the result of too much exercise, faulty running technique, or wearing incorrect footwear. All of these can cause inflammation of the tendon, known as tendinitis (see Figure2), and tearing of the tendon fibers. In most cases, these conditions clear up with rest and physiotherapy. Despite its size and strength the Achilles tendon is surprisingly vulnerable, and violent stretching of it can cause it to rupture. In fact, it is the most frequently ruptured tendon in the body: an injury that feels like being kicked painfully and hard in the back of the ankle. In such cases, surgical repair of the tendon may be necessary. 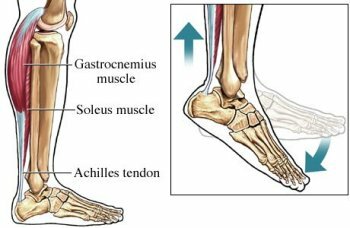 Achilles tendinitis is inflammation, irritation, and swelling of the Achilles tendon, usually caused by overuse or arthritis, although inflammation can also be associated with trauma and infection. Tendinitis due to overuse is most common in younger people and can occur in walkers, runners, or other athletes, especially in sports such as basketball that involve jumping. Tendinitis from arthritis is more common in the middle-aged and elderly. Arthritis often causes extra bony growths around joints, and if this occurs around the heel where the Achilles tendon attaches to the heel bone, the tendon can become inflamed and painful. Symptoms usually include pain in the heel when walking or running. The tendon is usually painful to touch and the skin over the tendon may be swollen and warm. Achilles tendinitis may put an individual at risk for an Achilles rupture. Treatment is usually by non-steroidal anti-inflammatory drugs (NSAIDs) such as aspirin and ibuprofen, rest, ice, and physical therapy. In addition, any activities that make the symptoms worse should be avoided. Occasionally, a cast, brace, or boot may be used to immobilize the heel and allow the swelling to go down. If these treatments fail to improve symptoms, surgery may be needed to remove inflamed tissue and abnormal areas of the tendon. Conservative therapy is usually successful in improving symptoms, although they may recur if the offending activity is not limited or if the strength and flexibility of the tendon is not maintained. When necessary, surgery has been shown to be very effective in improving pain symptoms. However, if pain does not improve with treatment and vigorous activity is continued, the tendon is at risk of completely tearing. This occurs because the inflamed tendon is abnormal and weak and continued activity can cause it to rupture. In this case surgical repair is necessary, but made more difficult because the tendon is not normal.